We’ve been experiencing a bit of a chill in Minnesota. It’s not that we haven’t been here before, we have. But, it’s been a few years since the subzero temperatures of today, were quite so low. We are owning our bragging rights. 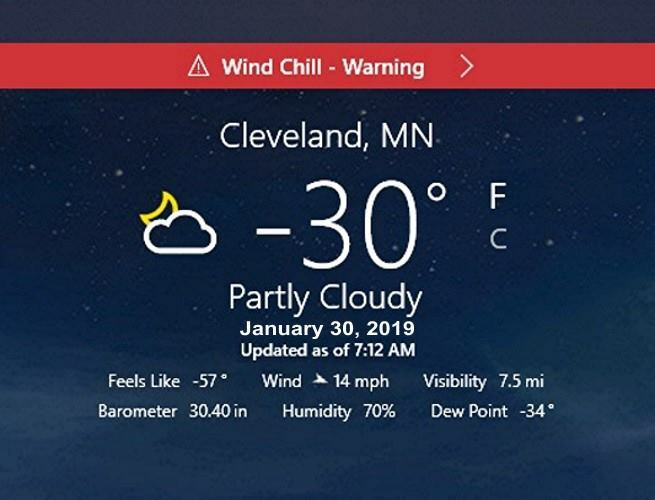 Family members from my home town in southern Minnesota were posting on Facebook the minus 30 degrees farenheit registered this morning. There have been some nasty surprises today. Electrical poles have split from the cold and other poles had equipment failures, leading to power outages. One area of the state has a natural gas breakdown going on. The official word is their system is “strained.” Xcel Energy has rented motel rooms for those without gas. A Sheriff’s office is dropping off space heaters. It was too cold for Deicer to work at the airport this morning. Flights were canceled until we warmed up to minus 22 below zero. Even our Light Rail got messed up when a rail cracked early this morning. Most schools have opted out of having classes. Some have been off since the snow and wind of Monday. Metro area schools have already closed for tomorrow. The police are handing out warm coats, gloves and scarves to the homeless. Some shelters are running 24/7 instead of their normal overnight hours. Mail wasn’t delivered today. Black ice on highways from exhausts remains treacherous. Grocery stores are cutting their hours. Restaurants are running cold weather specials. The frigid weather is causing us to focus on something other than the ongoing turmoil in Washington. On the positive side is knowing invasive species, like the Emerald Ash Bore, cannot survive in these temperatures. Retirement gives me the luxury of not needing to go outside today. But, I feel for people who have no choice. I think of those doing their jobs so that other people can be safe. I worry about the homeless who haven’t found a space for the night. A few minutes ago Xcel asked all of their customer to set their thermostats at 63 degrees, so there is enough natural gas to go around. I think of how we are all in this together. Politics, whether we lean to the left or the right, to the Red or the Blue isn’t of importance in this cold. Basic humanity is. This entry was posted in Faith & Life, Values and tagged -30 degrees, All in this together, Frigid temperatures, Weather. Bookmark the permalink. Prayers for all of you! I remember the winter of 1983 (Thanksgiving) when I drove home to Austin from UTS. Exhaust was freezing on I-35W and I barely made it through a swirl of cars spinning and skidding. Yes, UTS in 1983-1984 – blizzards and ice. Fortunately, the heat works at my house. Thanks for your good wishes.